Cast: Michael Sheen, Frank Langella, Sam Rockwell, Kevin Bacon, Oliver Platt, Matthew MacFadyen, Rebecca Hall, Toby Jones. Story: David Frost interviews Richard Nixon after Watergate. I guess you've heard about Frost/Nixon by now and are probably curious. Can a movie about an interview possibly be as good as they're saying it is? Well, if you're at all interested then you won't want to miss the opportunity to find out for yourself. I can't say I ever "got" David Frost. Coming in as I did on the tail end of his career, watching him doze off on Through the Keyhole when I should have been revising, cringing at his inability to construct a coherent argument on his final interviews, he's always seemed like a bit of a fudgecake to me. I was rather pleased, then, to see him portrayed not as some crusading angel, rather as a regular flawed fellow who happens to be good at TV presenting. Michael Sheen gives a captivating performance, concentrating as he does on the content rather than trying to do an impression (which he was guilty of in The Queen). My guess is that Frank Langella, as Nixon, will be largely unfamiliar to British audiences, though you'll know the face. Last time you probably saw it was on the shoulders of Clark Kent's boss in Superman Returns - though I'll confess I didn't make the connection until I looked it up. He, too, gives a heavyweight and highly enjoyable turn and has been rewarded with the Oscar nomination that arguably should've gone to his co-star. Will he win it? Unlikely, it doesn't feel Oscary. Frost/Nixon has a difficult brief, but it's completely gripping. As talkies go, it's hard to imagine a better one. Great performances, solid story, superb direction. Excellent. To enjoy this film: give it a try. 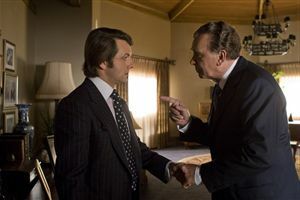 Frost/Nixon was released in the UK on 23rd January 2009.